Guitar Hero, Cooking Hero, What's Next? Thread: Guitar Hero, Cooking Hero, What's Next? 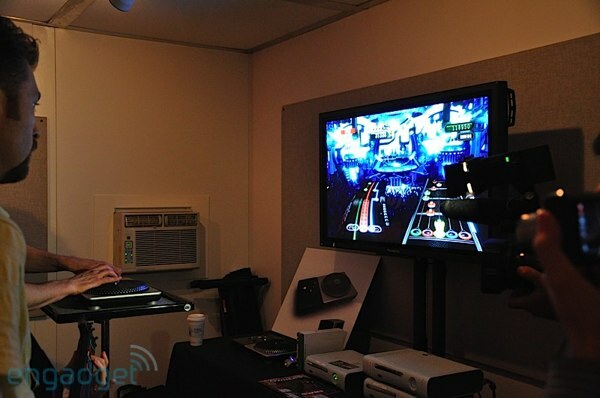 We've already seen a bit of guitar in DJ Hero, but apparently it might not just be a one way street: Neversoft (developer of the Guitar Hero franchise for Activision) hinted to Eurogamer at E3 that they're interested in bringing the DJ Hero turntable to future versions of Guitar Hero. They also aren't ruling out the possibility of bringing drums to DJ Hero -- which seems to us an even more exciting prospect -- and we're sure in a few years time you'll be able to direct wire Activision to your bank account and fill you living room to the brim with more-or-less interoperable pretend instruments. I don't get where their logic is. Turntables are NOT musical instruments the way guitar and drums are. They are music manipulators. So what? You're gonna be scratching on a live performance? Maybe add a Phase on that Bass Guitar? Last edited by Tarek; Jun 14th, 2009 at 19:03. I Hate DJ Hero, The beatiful and addicting Electronic music is going to become commercial bye all the Guitar Hero Nerds buying that Game! Hmm. While the game concept doesn't resemble Konami's Beatmania (their take on a DJ-like game - which is button tapping really :D), can't really say for sure whether this will be a big hit. I see it differently.... I'm the only one in my friendgroup that likes Trance & Progressive. So I see it as a neat tool to turn their heads towards trance & progressive, by playing that game with them. You will have fun anyways, and they might get to love the music.... Win-win situation... WHORAY!!! Although personally I would never buy/play this, it will introduce these genres to a wide range of people that have not heard this music before. Good for US customers, we need more Trance & Progressive fans to here. Solarity "Part-Time Hero / Anti-Hero" Beatport Exclusive OUT NOW!! DJ Hero - Confirmed and..kind of..sad..
New Video Game "DJ HERO"